We love Easter time when it’s starting to brighten up outside and begin to get a bit warmer. 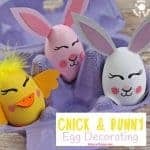 This cheerful Easter Egg Suncatcher Craft is a fantastic way to celebrate the colours of Spring. 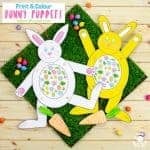 These easter suncatchers are fun and easy to make and really do look beautiful in the window with the sun shining through them. 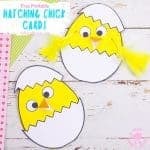 We think it’s fun to use them for hanging outside for Easter egg hunts too! 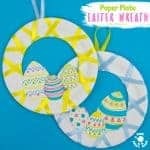 This pretty Easter egg suncatcher craft is easy to set up and because there’s no glue involved it’s pretty much mess free and easy to clear away too. 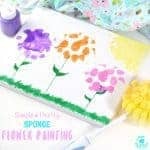 It’s a great craft for when you’re in a hurry or want something simple and it can easily be done with just one child or a whole class. 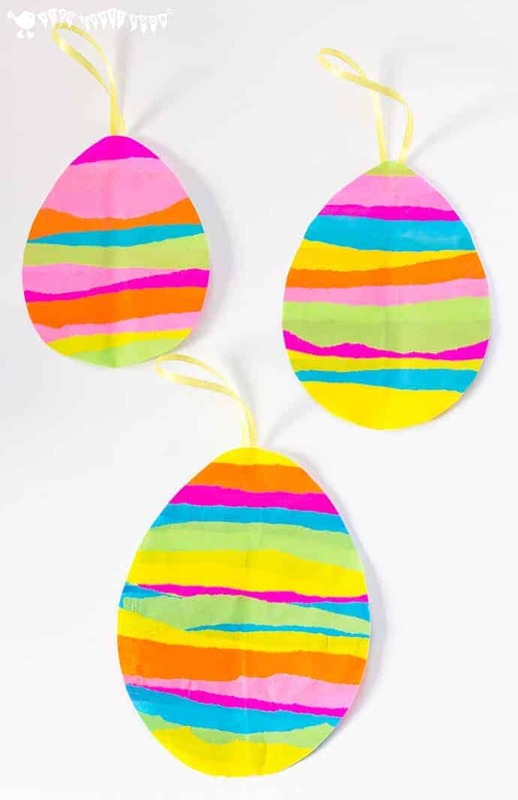 These colourful eggs are made from contact paper and torn tissue paper making it a really frugal craft and a great way for children to exercise their fine motor skills. 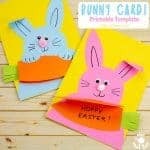 Because it’s an open ended activity each easter egg suncatcher craft will be as gorgeous and unique as the child that made it! 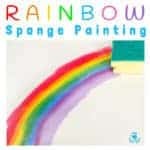 We’ve also got a lovely Fresh Flower Suncatcher and Mosaic Suncatcher craft you might like to see too. 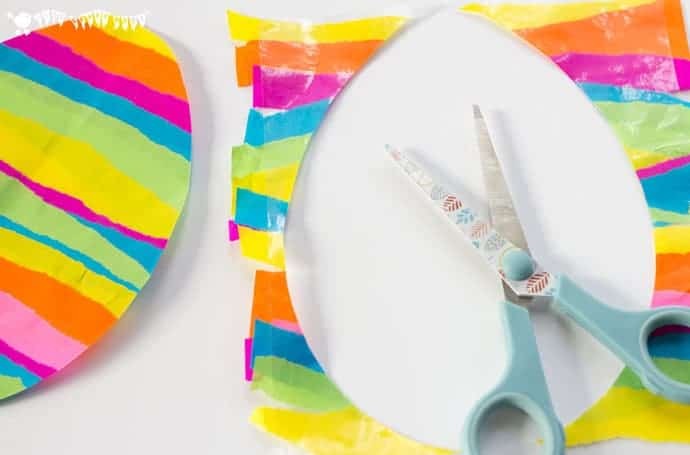 To make your Easter egg suncatchers start off by tearing bright tissue paper into strips. 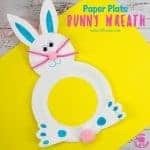 You can make the paper strips as thick or thin as you like. 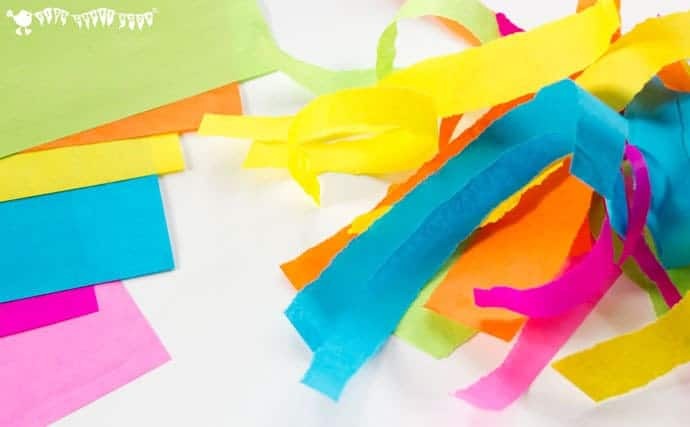 Tissue paper is fabulous to use in suncatchers because the colours really come to life with the sun shining through them and when they overlap you get some great colour mix effects too. Next, cut out two rectangles of contact paper the same size. You’ll cut these into egg shapes later so they can be any size you like. 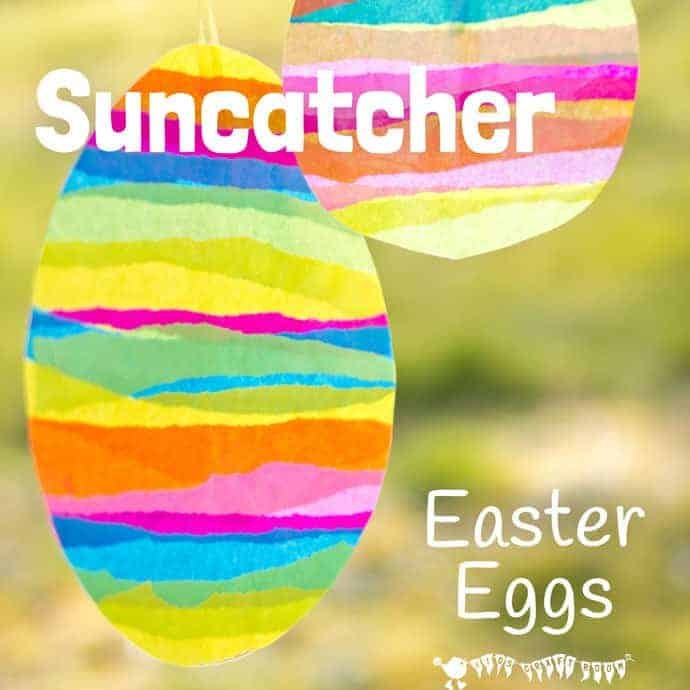 We think it’s fun to make a selection of Easter egg suncatchers in different sizes. Now it’s time to enjoy laying the tissue paper strips across the contact paper rectangle. You can cover the whole area, leave gaps and overlap the colours too. 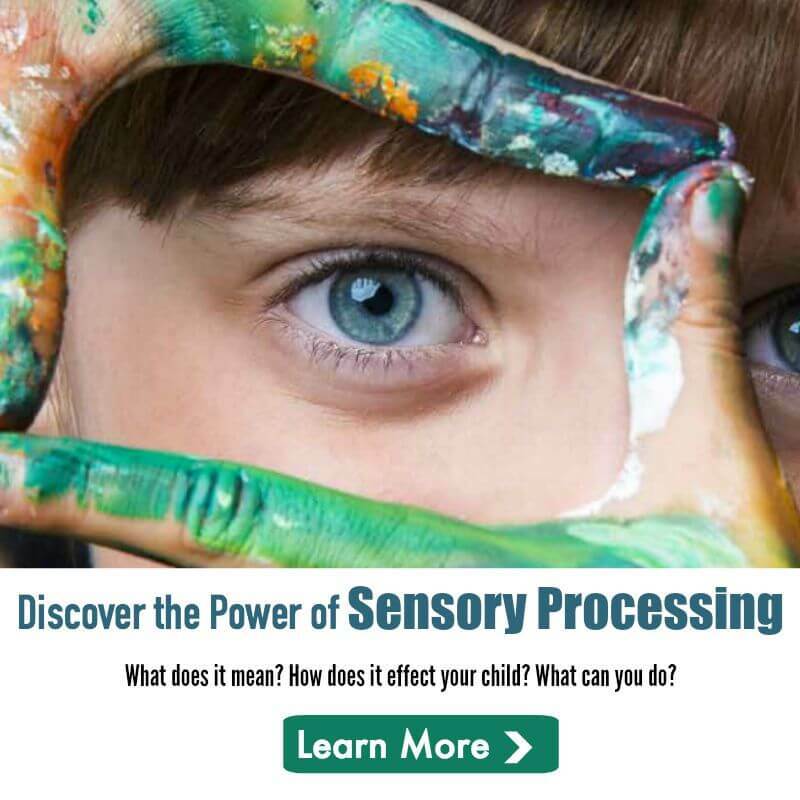 There’s no right or wrong way to do it and each egg suncatcher will be different. 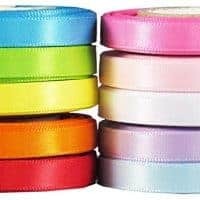 Once your coloured strips are in place, stick the second piece of contact paper over the top of the tissue paper to secure it. 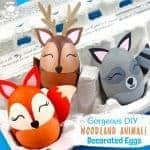 Then using a pencil draw on an egg shape and cut it out. Finally snip a bit of ribbon and use sticky tape to fix it to the top of the egg. 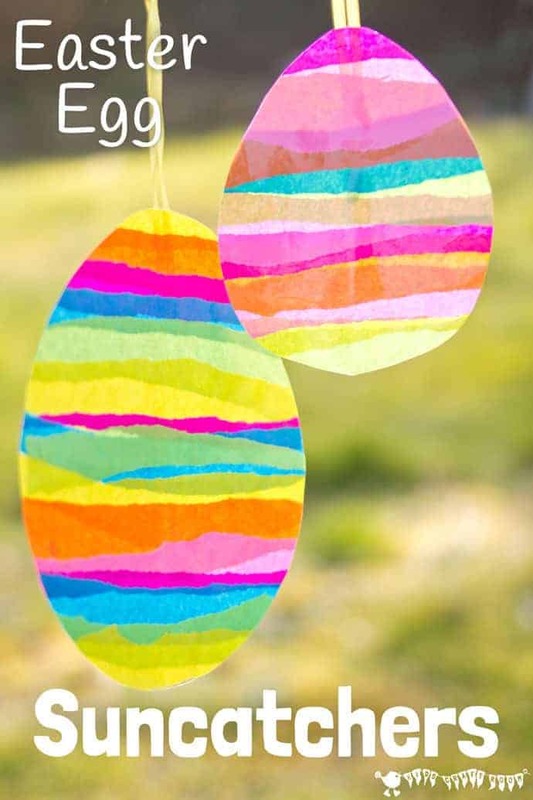 Now your Easter egg suncatchers are ready for hanging up on display. 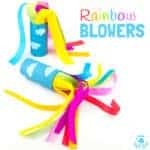 They look so colourful don’t they? 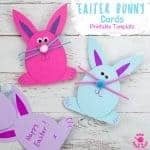 We love how each one is different and when you hang the Easter Egg suncatchers in the window the colours really zing and you get all sorts of new shades showing where the tissue paper overlaps. 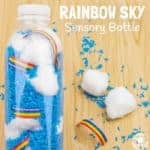 They remind us of watercolour paintings and bottles of sand art! 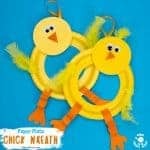 We’re going to try hanging them outside for a non-candy Easter egg hunt too. They won’t withstand lots of rain but we hope that the plastic contact paper coating will make them shower proof so they should last the day, even if the weather is a bit grim! 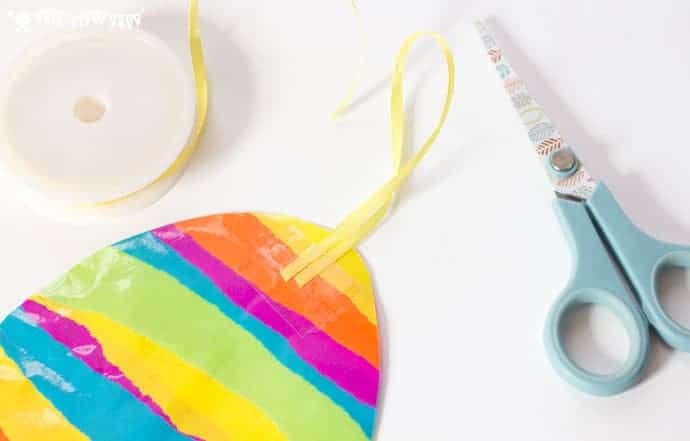 We hope you enjoyed this easy Easter suncatcher craft? Come and chat with us on Facebook, Pinterest , Instagram or YouTube or subscribe to our weekly craft newsletter. 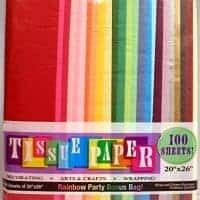 Start off by tearing bright tissue paper into strips. 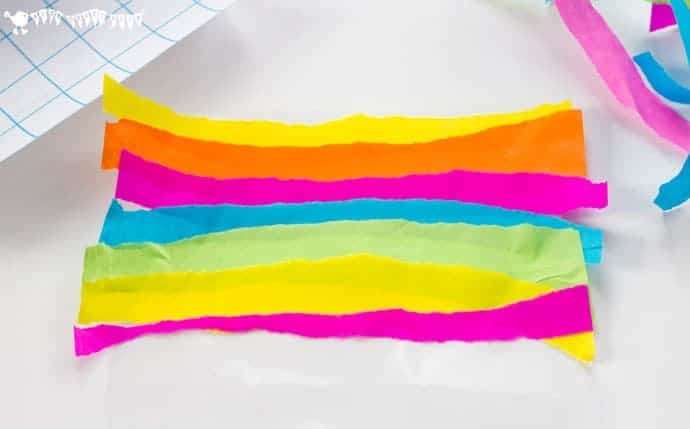 You can make the paper strips as thick or thin as you like. 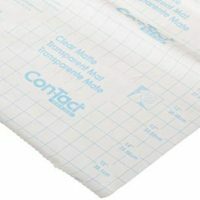 Lay the tissue paper strips across the contact paper rectangle. You can cover the whole area, leave gaps and overlap the colours too. There’s no right or wrong way to do it and each egg suncatcher will be different. I’m thrilled you like them Sarah, thanks for taking the time to let us know. I hope your toddler group has fun.